“Where does ‘highly happy’ come from—and can we have some too?! Are you a person who loves advice based on facts? Then this book is for you! This book is based on actual research–not some relationship therapist telling me their views on how to have a better marriage. The book focuses on small changes anyone can make to improve their marriage. The book is really a practical application of years of research the author and her husband conducted on couples who were struggling in their marriages, mostly happy and highly happy. 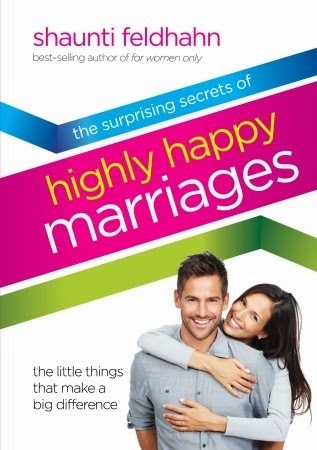 The author reveals 12 secrets she discovered in researching highly happy marriages and explains how spouses can implement them to take their marriage from good to great. One of my favorite quotes from the book...Highly happy couples quickly stop a negative train of thought or action, replacing unhappy or angry thoughts or actions with positive ones, in order to change their feelings. I really enjoyed this book. I'm always open to new marriage advice, tips and secrets! A great marriage requires constant work, continual weeding and working the soil in order to bloom into something beautiful. This book opened my eyes to some weedy areas that I need to work on. If your already part of a highly happy married couple or your in a struggling relationship I would encourage you to take a look at this book and see if you can up your own marital happiness by applying these secrets.